The entreprenurial brainchild of two of Seagram’s most venerable executives , who were also responsible for the wildly successful Captain Morgan and Patron brands, Redcliff was developed to fill a hole in the liqueur marketplace for a purely American brand. 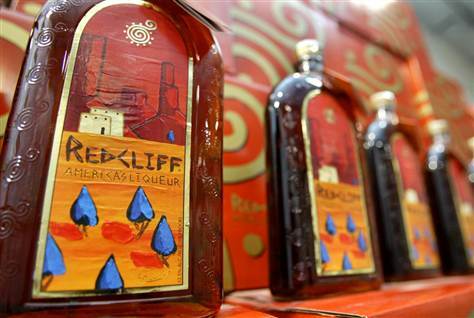 Redcliff was created as the American answer to Germany’s Jagermeister, France’s Grand Marnier and Italy’s Sambuca. Our challenge was to launch a brand new cola / vanilla / spice flavor profile to the same shot and slammer drinking college crowd who are already enamored with the mighty popularity of brands such as Jagermeister. We started with a positioning that directly compared our product to our biggest perceived competitor: claiming Redcliff as the “American Jagermeister.” We further identified it’s Americana character as the “Marlboro of liqueurs.” We developed communications that conveyed the same theme, such as “Redcliff Galloping into Watering Holes,” “harnessing up drinkers nationwide” and “A liqueur “on a totally different plain.” All of these communications were developed to dovetail into a fully integrated marketing and advertising campaign when budgets would allow. We started with a trade campaign targeted to on-premise operators and bartenders by saturating the trade with awareness about the product. From there, our campaign hit national consumer news outlets and narrowed down to consumer press seen by a nightclub going audience. To familiarize the press with Redcliff, we developed a special press mailer that exemplified the “all American” personality of the brand with a branded leather saddlebag. We filled it with a full-sized cowboy flask-shaped bottle, branded handkerchiefs and press kit materials. Stellar media placements included the world’s largest press outlet, Associated Press!